Small treats like these Valentines Day Crinkle Cookies will make everyone’s day just a little brighter. Now often holiday recipes are labour intensive and time consuming, but this one which starts with a cake mix comes together super quickly. These half homemade Cake mix cookies are pretty, tasty, and can be flavoured however you like. 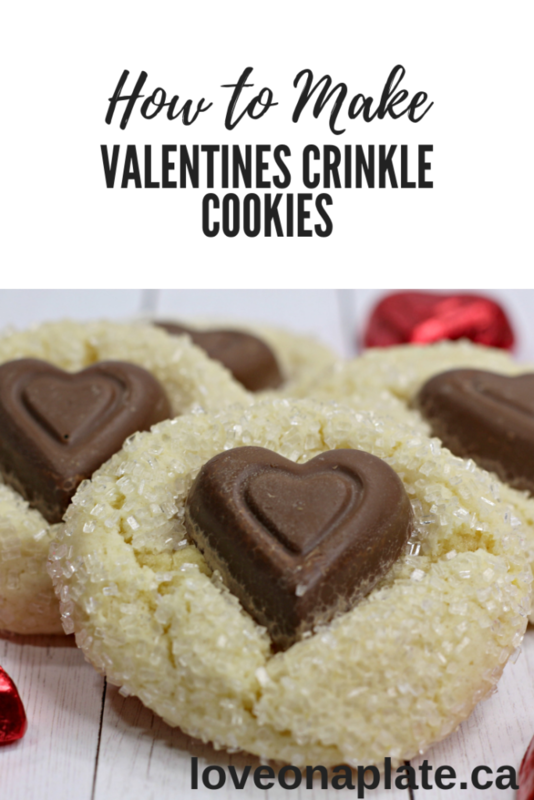 Valentines Day Crinkle Cookies make a great treat that kids can help make too! No Crinkle? I have the solution! I’ve made many crinkle cookie recipes, some from cake mixes, some from scratch, and sometimes they crinkle and sometimes they just don’t. It’s annoying, I know, I like they way the crinkle looks. Two small put important tips will make all the difference. Make sure that the dough is not to warm. I recommend chilling the dough at least an hour after it’s rolled into balls. Coating the outside of the dough in sanding sugar, or powdered sugar or cinnamon sugar will dry out the surface which creates the cracks as it bakes so don’t skip this step! 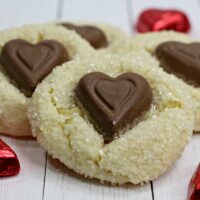 If you’re looking for a sweet treat that’s not a cookie, but also fun for the whole family to make, try my Chocolate Covered Jelly Hearts! They are so cute, and you can get all the supplies at most craft stores. Use whatever flavour extract you prefer in this flexible recipe. I like Almond and Vanilla best. Cookies and Cream, and Marshmallow are also great.